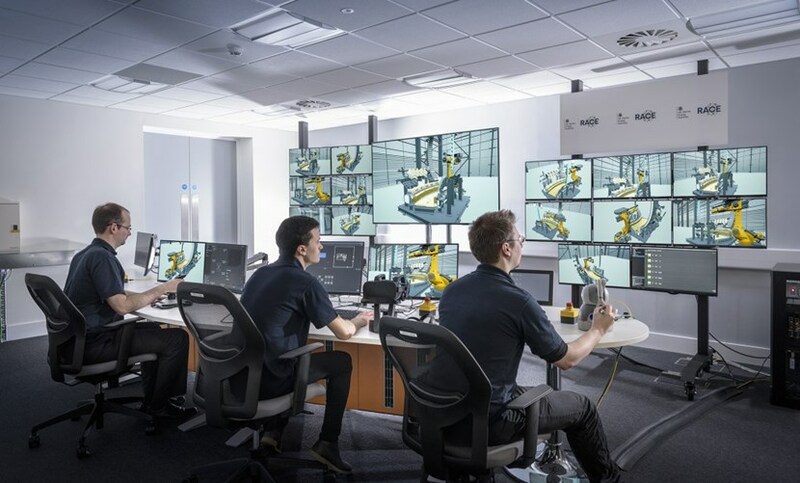 Through a technical collaboration established between the ITER Organization and the UK Atomic Energy Authority (UKAEA) in 2017, the UKAEA's centre for Remote Applications in Challenging Environments (RACE) is designing and planning mockup trials that will allow ITER's remote handling team and system owners to verify that component designs are well matched with the maintenance capabilities of the project. RACE will test and evaluate remote handling system designs through mockups and trials, and provide important operational feedback for final component design. (Pictured: the RACE control room). Remote handling has an essential role to play in the ITER Tokamak. When nuclear operation begins, it will be impossible to make changes, conduct inspections, or repair any of the machine components in the activated areas other than by remote handling. Components requiring maintenance or replacement will be removed through the cask and plug remote handling system and transferred to the Hot Cell Complex, where an array of bespoke, multipurpose tools will be in place to perform the required handling operations, such as lifting, rotating, tilting, fastening/unfastening, and cutting/welding of pipes. However, the complexity of maintenance operations over a wide array of systems and components—coupled with the risk that even a small hitch can have grave consequences for the continuity of machine operations—increases the importance of testing the maintenance solutions foreseen in the system designs before the components are tendered out for manufacturing. The ITER Organization is planning a mockup facility on site—the ITER Maintenance Test Facility—from 2022 onward, but what about the next five years? That's where the UKAEA's RACE facility lines up as a strong match for ITER's needs. Created in 2014 by the UKAEA at the Culham Centre for Fusion Energy (also home to the JET tokamak), RACE is already supporting a number of industry-led partnerships that are developing specific remote maintenance tasks for ITER. Teams there have the experience that comes from years of designing and operating JET's remote handling systems, and they are already thinking ahead to the remote handling challenges that will have to be overcome in the step after ITER, DEMO. Equipment is already on order for the first task: verifying the maintainability of ITER diagnostic port plugs. The generic equatorial port plug (GEPP) test stand will allow operators to simulate basic vertical insertion operations (pictured) as well as more complex cooling pipe and fastening operations. "There are real advantages to having a single facility with advanced capabilities and extensive experience to run a series of mockup tests for us over the next five years," stresses Spencer Pitcher, head of ITER's Remote Handling & Radioactive Materials Division. "Sharing best practice across a number of tasks, reusing common equipment for multiple mockups, and finally migrating specific structures and hardware back to ITER's on-site test facility at the end of activities makes this an efficient and cost-effective solution for all stakeholders." According to the terms of the collaboration, RACE will test and evaluate remote handling system designs, and conduct remote handling trials of generic and specific maintenance tasks in order to demonstrate the feasibility of remote handling tasks and provide operational feedback to the system designers. The first task is already underway: verifying the maintainability of the ITER diagnostic port plugs. These stainless steel plugs—measuring 3 metres in length and weighing up to 50 tonnes—will seal the openings (or ports) of the vacuum vessel. Port plug maintenance in the Hot Cell Facility will require the vertical handling of heavy loads, tilting, and the removal/insertion of diagnostic shield modules to tight tolerances—all operations that will be tested on a specific mockup in the RACE experiment hall. Since early this year, the design of the mockup stand has been advancing in close collaboration with ITER experts in diagnostic port plugs and remote handling. The detailed design of a generic equatorial port plug (GEPP) mockup and remote handling tooling has now been transferred to industry for fabrication and the first trial tests are expected in approximately four months. 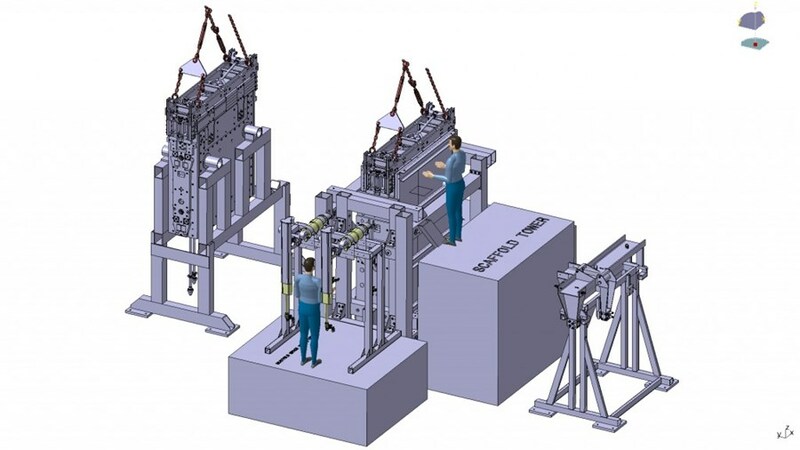 RACE will provide the handling capabilities that are representative of the ITER Hot Cell refurbishment cell assembly/disassembly zone, including overhead crane, telemanipulator arms and other tools. "When it comes to perfecting a remote handling process, fine details can make the difference between success and failure," explains remote handling engineer David Hamilton, who coordinates the collaboration with RACE. "And even with today's powerful computing techniques, in the end only physical modelling can give that final verification." Implementation agreements are already at an advanced state of preparation for two other tasks, relating to planned maintenance activities for the neutral beam cell and port cell interspaces (vacuum flanges), and the feasibility of cutting and welding the small bore pipes that provide cooling to the diagnostic first wall.